The solitaire game “The Tower of Hanoi” was invented in the 19th century by the French number theorist Édouard Lucas. The book presents its mathematical theory and offers a survey of the historical development from predecessors up to recent research. In addition to long-standing myths, it provides a detailed overview of the essential mathematical facts with complete proofs, and also includes unpublished material, e.g., on some captivating integer sequences. The main objects of research today are the so-called Hanoi graphs and the related Sierpiński graphs. Acknowledging the great popularity of the topic in computer science, algorithms, together with their correctness proofs, form an essential part of the book. 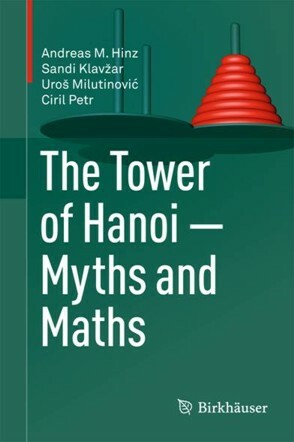 In view of the most important practical applications, namely in physics, network theory and cognitive (neuro)psychology, the book also addresses other structures related to the Tower of Hanoi and its variants. The updated second edition includes, for the first time in English, the breakthrough reached with the solution of the “The Reve's Puzzle” in 2014. This is a special case of the famed Frame-Stewart conjecture which is still open after more than 75 years. Enriched with elaborate illustrations, connections to other puzzles and challenges for the reader in the form of (solved) exercises as well as problems for further exploration, this book is enjoyable reading for students, educators, game enthusiasts and researchers alike. 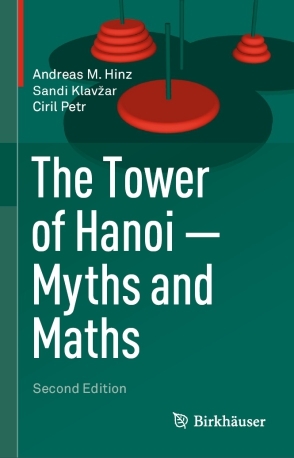 This is the first comprehensive monograph on the mathematical theory of the solitaire game “The Tower of Hanoi” which was invented in the 19th century by the French number theorist Édouard Lucas. The book comprises a survey of the historical development from the game's predecessors up to recent research in mathematics and applications in computer science and psychology. Apart from long-standing myths it contains a thorough, largely self-contained presentation of the essential mathematical facts with complete proofs, including also unpublished material. The main objects of research today are the so-called Hanoi graphs and the related Sierpiński graphs. Acknowledging the great popularity of the topic in computer science, algorithms and their correctness proofs form an essential part of the book. In view of the most important practical applications of the Tower of Hanoi and its variants, namely in physics, network theory, and cognitive (neuro)psychology, other related structures and puzzles like, e.g., the “Tower of London”, are addressed. Numerous captivating integer sequences arise along the way, but also many open questions impose themselves. Central among these is the famed Frame-Stewart conjecture. Despite many attempts to decide it and large-scale numerical experiments supporting its truth, it remains unsettled after more than 70 years and thus demonstrates the timeliness of the topic. Enriched with elaborate illustrations, connections to other puzzles and challenges for the reader in the form of (solved) exercises as well as problems for further exploration, this book is an enjoyable reading for students, educators, game enthusiasts and researchers alike.